Foot path/platform on which bus stop is located is almost in level with road surfaces, which may allow two wheeler to run their vehicle over foot path. Even water may log near sitting place during rainy weather under such situations. There is no proper draining facility for rain and sewer water. The waiting place was somewhat congested with less waiting/sitting place, no lightening arrangement and little shelter area. Material wastes and paper wastes were spread here and there; due to unavailability of dust-bins, thus creating un-hygienic conditions. Metal boards (which is acting as stops) near the bus stop were very near to sitting place, giving less walkway width with only two side openings. This may create problem when people rush to catch the bus from their sitting position. Remember you need not want to write the detailed individual solutions as the questions demands only illustration in the form of sketches. Sketch illustrating solution for problem 4 and 5. Now, as we had gone through illustrations for the problems, I will be pointing some important findings or suggestions that you will find helpful for attempting Problem identification and analysis questions. I had already discussed similar points in my other posts but just to make sure that you won't forget these tips, i am once again reminding you. I avoided human sketches in the above illustrations as it might have consumed more time (at least to my sketching level). The first picture was drawn with more details to give impression, and I slowly reduced giving more details for the remaining illustrations. I avoided sketching advertisements (like those shown in question), trees and other wall pictures to focus more on the problem. I avoided coloring and used only basic pencil sketching. I maintained the same view/perception of bus-stop as shown in the question to showcase a standard and impress. I used ruler (scale) for border making, however you may also use scale for drawing straight lines (as usage of scale is not restricted in the question). Frankly speaking, it took more time for me to complete these illustrations (of course i am average in sketching). But, If you apply the above thumb rules, you may easily put your ideas in lesser time. Remember you will be given only 20 marks for this question and for 20 marks you cannot spend hell lot of time just for detailing. As a suggestion from my end, identify and think for very simple but different solutions. Keep your sketches plain/simple; giving less importance to shading works. The more you spend time for problem identification (rather than for sketching), better will be impression on you as well as your result. Please don't overdo or over show your artistic intelligence. Concentrate on shadings or coloring only if specified particularly. These tips may help to people like me (whom got average or low sketching skills).If you are an artistic genius then you may proceed with your own style. You may suggest some additions to this page on "problem Identification and Analysis for Bus-stop". You are most welcome to leave comment regarding my sketching or anything like idea change or so. I would be happy to hear others views also; and of course you too do right ? and don't forget to like stuffyoulook Facebook page (to get updated with latest posts). 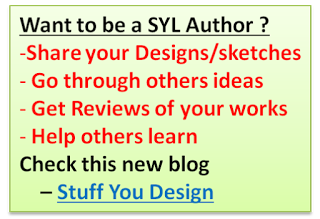 Follow Stuffyoulook Facebook page to get updated about latest posts. Hello Bhanu, These are my identified problems. 1) Sitting width is small . 2)The outer round boundary profile guard can be made of flat profile with a littl lower height ,so more ppl can sit on it. 3)The width of Aisle is less. 6) Fonts used in bus no. n bus stops names is too small. we draw different images for different suggestions or we can draw all suggestions in one image? As per the requirement of the ques, we need to identify 5 unique problem as well as illustrate them with sketches, so obviously ur diff. images should depict diff situations, and in the final wraup-up (final sketch), u need to club them together and show the actual idea. That is how most design questions are presented. First aid-kit should be there ,in case of accident or emergency. The sitting area can be on an elevated pedestal so that the rain water does not splash inside. ya, it can, gud idea, but they haven't mentioned it in the ques, so it's not mandatory!